For solo travelers, this hotel is an appropriate choice offering dorm rooms and private rooms. The rooms are clean with double and small dressing area. The common bathroom and shower room are also clean and well-maintained. You can enjoy a healthy breakfast including eggs, waffle, toast, tea and coffee, also the bar serves sizzling drinks with light snacks. A 2-star accommodation is offered at Here Hostel Bangkok which is located at the Ratchadamnoen road in Phranakorn area of Bangkok. 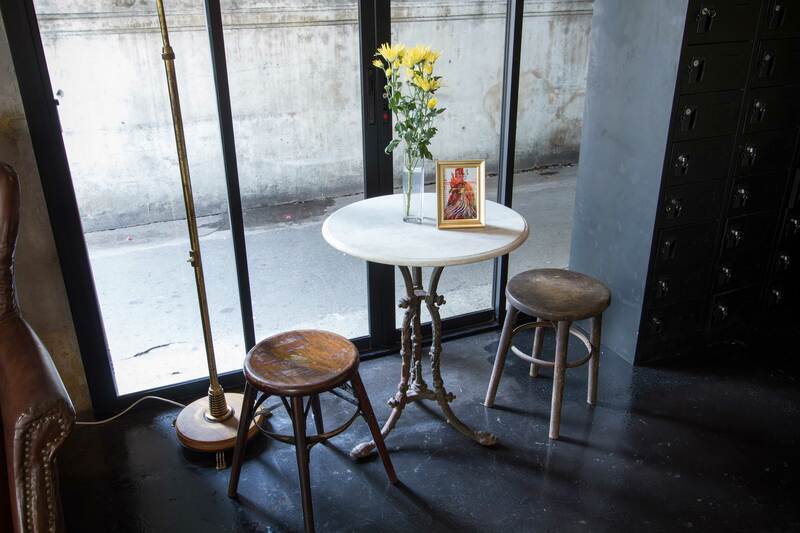 Here Hostel Bangkok is located in the Old Town Bangkok and surrounded by revered historical attractions like Loha Prasat, Metal Castle, and Rattanakosin Exhibition Hall. Don Mueang International Airport is 20 km away which is the nearest airport to this place. An environmentally friendly and nature-conserving conceptual design has been adopted by Here Hostel. Wooden panels from old houses have been taken and assembled into appealing contrasts of wooden shades and textures. Khaosan road can be reached in just 5-10 minutes from the hostel, where one can explore the nightlife and enjoy a shopping spree. It is perfect for solo travelers and couples or a group of wanderers looking to get a hands-on experience on how the locals live in Bangkok, away from all the luxurious amenities amidst a more natural surrounding. 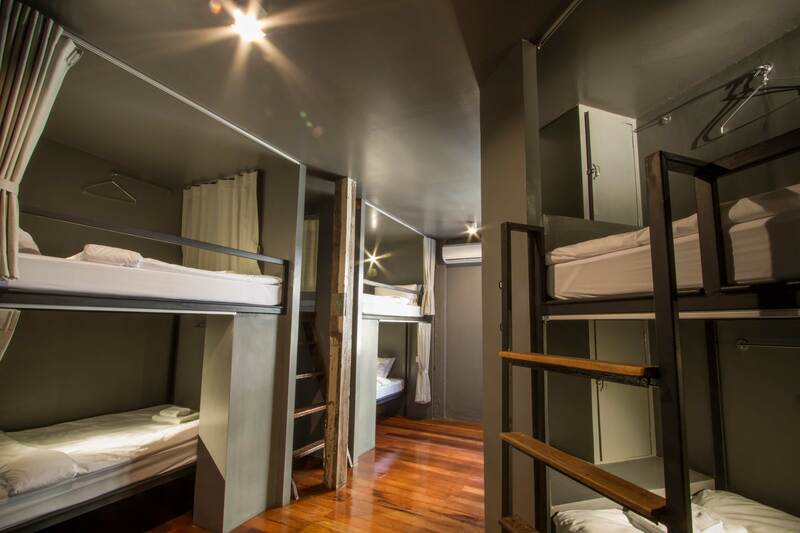 9 types of dormitory-type rooms are available in Here Hostel Bangkok. The categories are 10-Bed Mixed Dorm, 8-Bed Mixed Dorm, 6-Bed Mixed Dorm, 4-Bed Mixed Dorm, Ladies Room, Small Room, Standard Room, Double Room, and Quadruple Room. Both the 8-Bed Mixed Dorm and 10-Bed Mixed Dorm guests get to enjoy the street view. A separate Ladies Room has been provided for all the female guests who are uncomfortable sharing the room with male visitors. All the rooms have shared bathrooms except the Double Rooms. The basic facilities, services, and amenities are easily accessible to all the guests of the hostel. The hostel accommodation rates are quite reasonable with the cheapest room being the 10-Bed Mixed dorm and 8-Bed Mixed Dorm and the most expensive one being the Quadruple Room. Free wifi is provided in all the rooms at Here Hostel Bangkok. The living area features an interactive space where guests can play games or watch a movie. A guest pantry with fridge, microwave and water boiler is available for guests use 24/7. 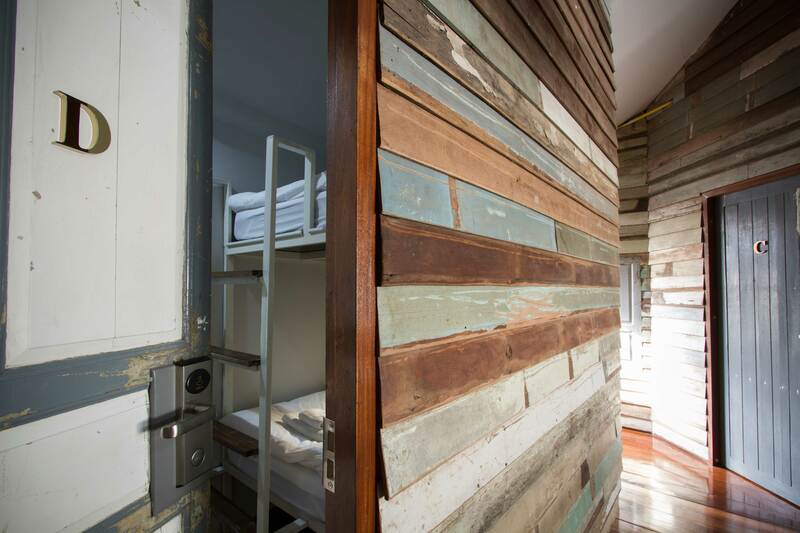 Laundry service and storage space are also provided for the convenience and comfort of the hostel inmates. Other useful amenities like basic toiletries and hairdryer are also provided. 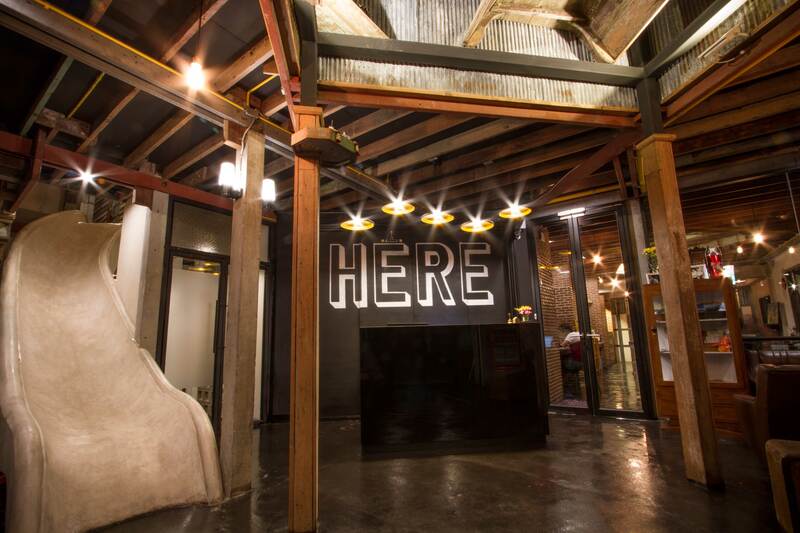 The front desk of the hostel can be approached anytime for information about traveling to explore the nearby popular destinations of the city. 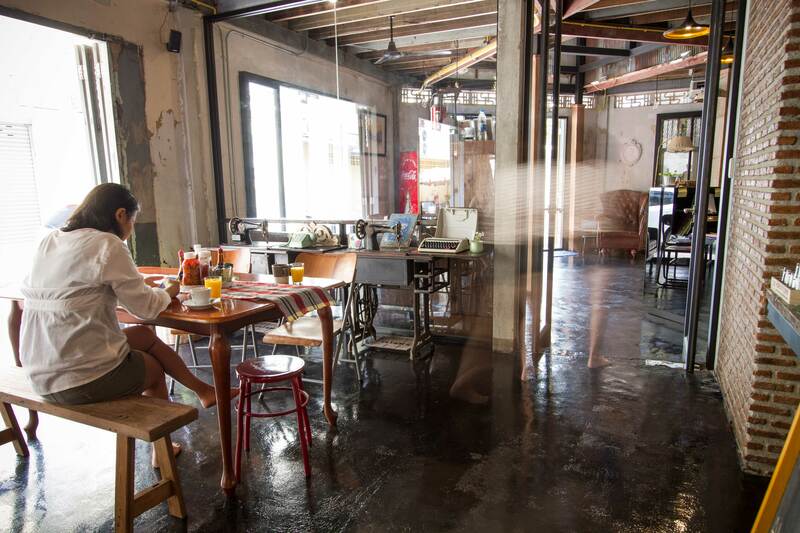 Free breakfast can be relished by the residents of Here Hostel Bangkok every morning from 07:30 AM to 10:00 AM. Freshly brewed coffee and tea can be ordered free of cost. The hostel houses its very own There Bar & Garden where an appetizing meal can be relished on for breakfast, lunch and dinner. Guests can visit here during the evenings to enjoy the casual atmosphere surrounded by nature while sipping on the variety of cocktails, mocktails, and other refreshing beverages. 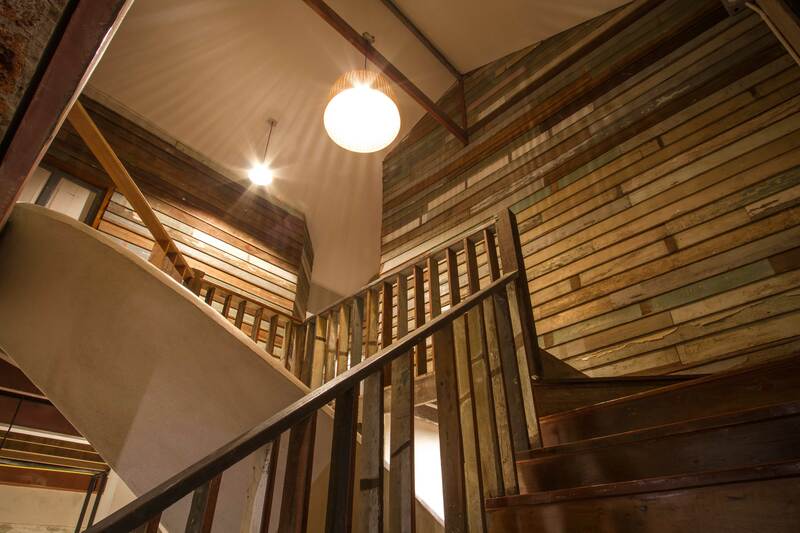 Here Hostel Bangkok is a renovated version of a 100-year-old house but has still managed to sustain the old rustic feel. It is a perfect place for all the nature lovers and travelers who would love to experience the authentic Thai culture by living in the traditional Thai style. 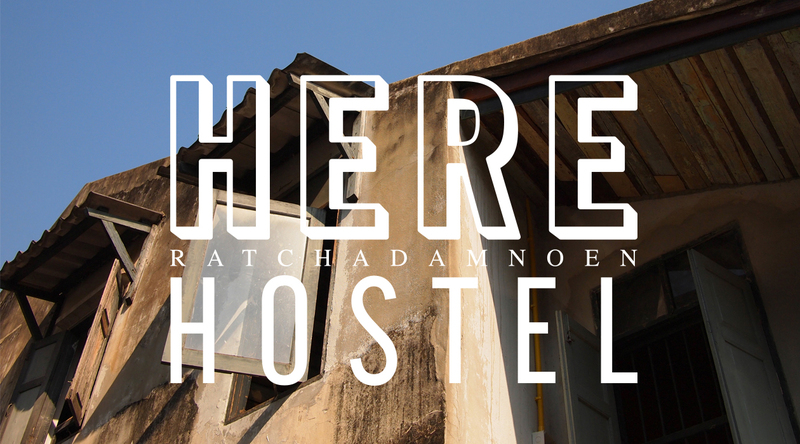 Which all languages can the staff members of Here Hostel Bangkok speak in? The hostel staff members can fluently speak and understand English and Thai. What are the recreational activities offered at the hostel? A game room is provided at the hostel where guests can interact with each other and bond over the several game options available. Is smoking permitted in Here Hostel? Guests are not allowed to smoke inside the dorms or any of the rooms to facilitate the preservation of the fresh environment and also for the comfort of the other guests residing in the same dormitory. What are the facilities which are available for the kids? For a good nights rest, families with children can ask for staying in the family room and other than this, a kids club is also accessible by all the young guests of the hostel. Are the rooms and dorms air conditioned? Yes, all the rooms and dormitories of this hostel are fully air-conditioned making it ideal for staying during the hot months. 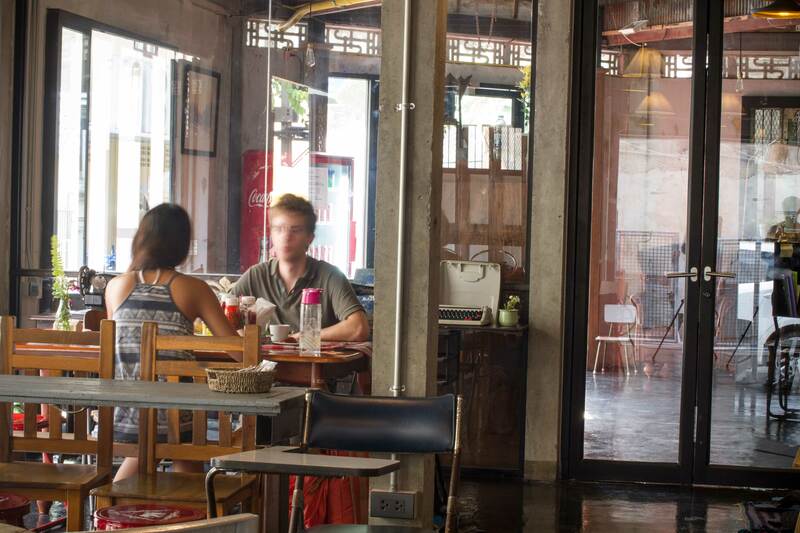 This hostel offers the greatest convenience in reaching the nightlife, shopping, and sightseeing district of Bangkok. It is undoubtedly the most popular pick for both business and leisure travelers. The hostel is just 1.8 km away from the City Centre. Under favorable conditions, the airport can be reached in a short span of 43 minutes. 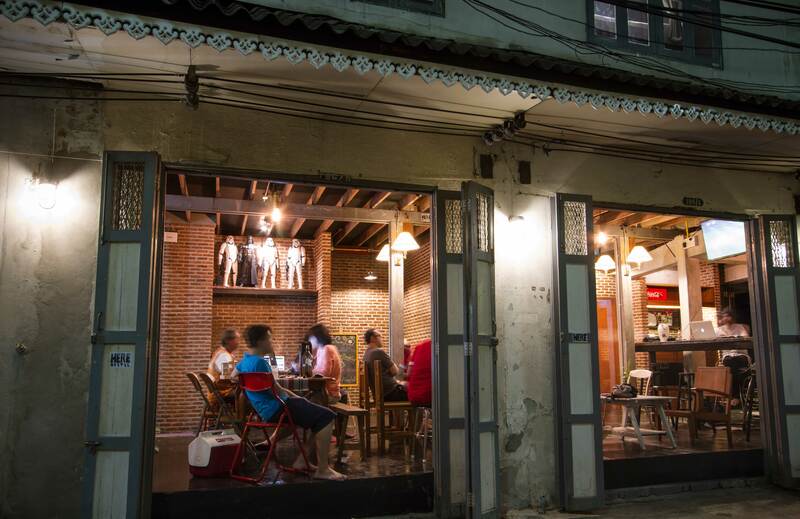 Being situated in the most convenient area, the hostel offers easy access to must-see destinations of Bangkok. Impeccable service and all the essential amenities are offered in abundance in this hostel to invigorate travelers. 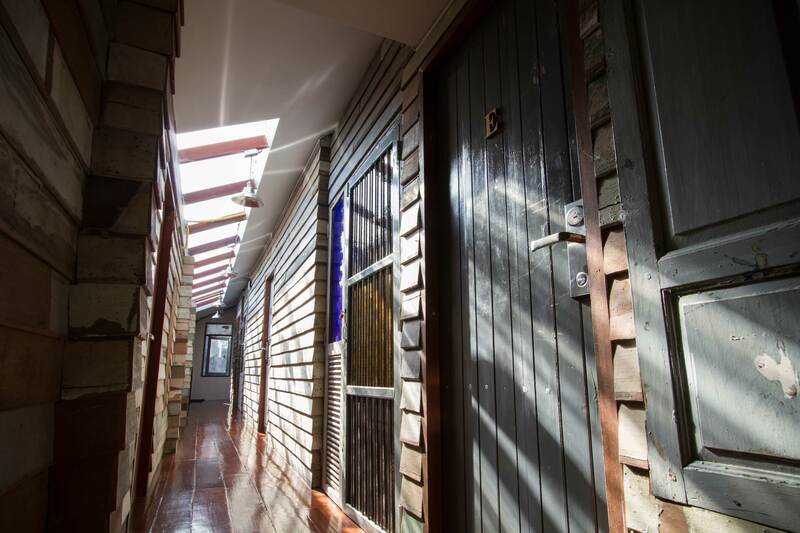 Access to a vast array of services, including 24-hour security, free Wi-Fi in all rooms and areas of the hostel, 24-hour front desk, luggage storage and much more is offered here. 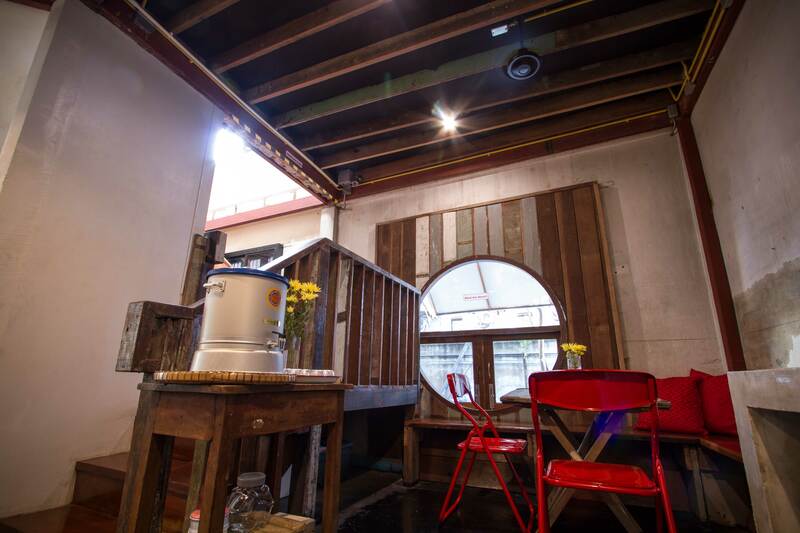 The nature-driven ambiance of Here Hostel Bangkok is reflected in every dormitory and room. Some useful facilities like non-smoking rooms, full air conditioning, blackout curtains etc can be found throughout the hostel property. 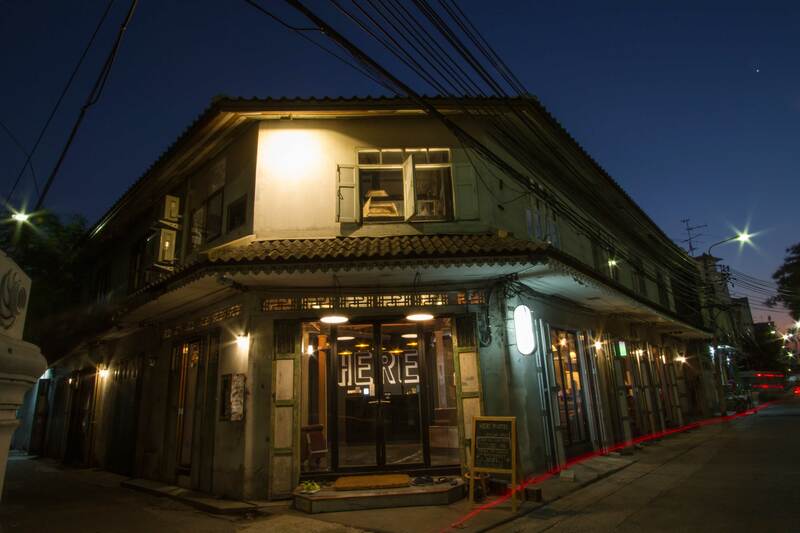 Here Hostel Bangkok is the perfect venue for an exhilarating nature-driven experience and must be visited by all the travelers who would love to know the real Thai lifestyle and culture.